Right, I’ve been updating some older posts, as things have changed a little bit since I started this project and I’ve also had some additional information, alongside the fact that I’ve actually been to a few more of the supermarkets in the list I’ve done. I’m going to try to add more stuff to the site as well, I’ve got a fair few restarant’s I should be writing up, but it all takes time. I also need to add more stuff to the FindIT map, but again, this is a hobby project and it’s not as if I have unlimited to do this. This isn’t a recipe as such, but if you like me have lived away from your home country for a long time, sometimes you get the urge for something special from back home. Well, I found something really great here, thanks to a fellow Swede who used to live here. 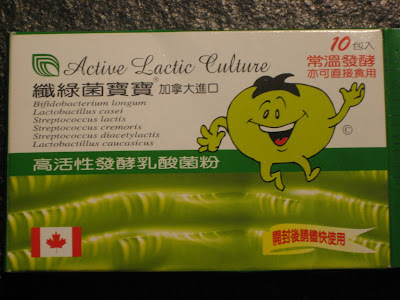 You can actually buy little packets of Active Lactic Culture here, there are a few different kinds and make sure you don’t pay too much, as the going rate for a pack of 10 sachets is about NT$250. I’ve seen shops sell the same stuff for twice the price and some other brands for near enough four times the price. It’s kept in the refrigerator in health food stores here, so make sure you look in the right place. Also make sure you store it in your fridge. The Active Lactic Culture makes something that is very similar to Swedish Filmjölk, although it’s not quite as tangy. The only similar thing I know of in English is buttermilk, but it’s not the same, as buttermilk is very sour. It’s really easy to make and doesn’t require any cooking skills at all. You could actually put the powder into a milk carton or bottle, but it’s hard to check if it’s ready of you do this. I use a semi-clear drinking bottle with a wide opening. Pour the milk in, it doesn’t seem to matter if it’s cold or room temperature and there’s no need to bring it up a high heat as with yogurt. It might take a little bit longer if it’s cold, but that’s about it. Add the sachet of Active Lactic Culture powde, shake gently and leave outside in a warm (not hot) place for 12-16h, although the instructions say up to 24-36h if it’s cold, but I’ve never had to leave mine for more than about 16h. When finished, the top of the milk should be set, kind of like yogurt, now move the container carefully into the fridge, don’t shake it, as that seems to make it lumpy. Let it cool down for 2-3h and then you can shake it up. The texture should be like thick drinking yogurt and it should have a fresh smell. If it smells funky, then something went wrong in the process and I had this happen to me once. The good thing is that just as with yogurt, you can use what you’ve just made as a base for making more. Add 2-3 table spoons to 1 litre of milk for your next batch and repeat the rest of the steps above. Right now things are just plodding along, nothing much new to report, just trying to get on with stuff and keep my fingers crossed that everything will work out in the long run. For those of you that live in Taiwan or are visiting, you might want to head to the Tavern this Thursday night, as the Taipei Tech Club is meeting up, if you’re interested in meeting up with some of the people that works in the tech industry here. We try to meet up once a month, although we’re not so well organised, so it happens a bit at a whim.